These are the reviews for Dairy Barn. There are 29 reviews. Very relaxing and homely, great place to go if you want to relax, but also pubs and town a 10 minute drive away. Owners were very helpful. Thoroughly enjoyed, would definitely go back. Arriving to freshly baked brownies and bread and home made jam was a brilliant introduction to the Dairy Barn, Cropthorne. As some places we've stayed are only equipped for overnight stays, we appreciated that Sue made sure that the Dairy Barn was well stocked with essentials for a longer stay. We loved that the place is down a quiet lane overlooking the hills and fields and enjoyed the company of Nigel and Nigella (cats) and visiting the cows in the barn. Thank you Sue for your warm welcome and friendliness. Lovely cottage, quiet, relaxing and in a beautiful area. We will definitely be booking again. An amazing place, loved everything about this place. A brilliant little barn with everything we needed. One of the best cottages we have been to. Would recommend to anyone to visit. A lovely, clean, quiet and relaxing place to get away! The hot tub was a great too! Accommodation was excellent, decoration and amenities to a very high standard. The private hot tub was amazing! The most comfortable bed we have ever slept in. Owners were warm, friendly, helpful and inviting and the home-made bread/brownies and fresh farmhouse eggs were a very lovely touch. A fantastic holiday cottage with a warm welcome on arrival. Would recommend. The atmosphere was welcoming, and the accommodation was outstanding. Plus, the alpacas out by the garden was a nice bonus. Fabulous place! The welcome pack provided by the owner was delightful. The atmosphere in the cottage was very calm and peaceful and the hot tub was wonderful after our long walks. This holiday was our first, the whole time we were there was magical. The cleanliness of the cottage, the warm welcome and the high quality made for a great break of R&R. The hot tub and log burner were particularly great touches. Such a wonderful place. We would definitely return here again and recommend this to friends. Such a wonderful place. Amazing location which made you feel like you were in the middle of nowhere. Mr and Mrs Hutchings (the owners) were extremely friendly and helpful as you needed. Parking on the drive was accessible and convenient. There are 2 separate accommodation houses on site, the dairy barn and the parlour barn (adjoining properties). We were greeted in the house with a bowl of freshly laid eggs, a homemade loaf of bread, home made jam and 2 slices of cake. A very pleasant surprise! The accommodation was made up of 2 main rooms, first room had a kitchen/dining room/ living room which was very modern yet cosy. There is a log burner also (we didn't try this as weather too warm it can imagine it's lovely in the colder weather). The kitchen was very well equipped (including washing machine). All appliances worked brilliantly and there was even a dishwasher if you couldn't be bothered to wash up! Free WiFi with good connection. The living area had a comfy 2-sweater leather sofa with a single arm chair as well. There was a large TV on a cabinet (cabinet filled with DVD's, games and tourist information). The dining area had a wooden table and chairs to eat meals at. The second room was the bedroom. The bed is a lovely wooden sleigh bed and was so comfortable. Small TV on the wall in the bedroom and plenty of drawers and a wardrobe for clothes etc. Underfloor heating was very good, you could adjust the room temperature in each room by an electronic gauge on the wall. The outside garden at the back was very spacious. This had a gas BBQ all ready to use with garden furniture (x2 sun loungers and table and chairs). The hot tub was so luxurious. 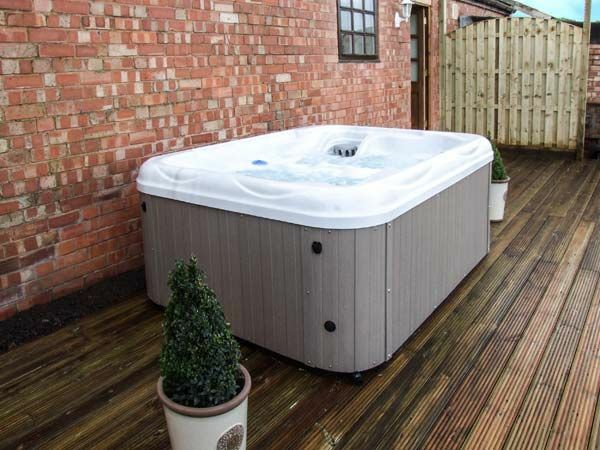 Was lovely to be able to hop in whenever you wanted in the privacy of your own garden area. Towels are provided (2 bath towels and 2 hand towels). We brought our own towels for the hot tub which is advisable. Pershore and Evesham (the two towns in which the accommodation is located between) are very pleasant towns go visit with good amenities and places to walk/cycle. We would definitely return here again and recommend this to friends. The only down side was that the divide between the 2 houses (dairy barn and parlour barn) was only a wooden fencing panel. It was private however if both couples were using the gardens at the same time then you can hear conversations so didn't feel very private. Everything about the holiday was lovely, the cottage was clean and tidy, the owners were really welcoming and the garden and hot tub were fabulous. Friendly owners and a great location. There were lovely welcome goodies, a fantastic hot tub and everything you could possible need was provided. This was a surprise for my boyfriends birthday, it was absolutely perfect! It had everything we could possibly need, and relaxing in the hot tub after a day of exploring just topped it. Will definitely be returning and recommending. Very peaceful and pleasant location and well accommodated. Tasteful decoration, well equipped and cosy. Cleanliness was of high standard. Overall an excellent place to stay! 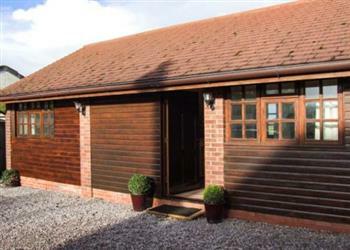 The accommodation was very comfortable and homely with a modern, yet cosy, country cottage feel. The owner had thought of everything to make the barn a home from home. Spotlessly clean, peaceful and friendly llamas in the back field which added to the novelty! The hot tub was something special, it was one of the highlights of our stay. Laying back and looking at the stars was amazing! For a relaxing, romantic and stress free get away, we would thoroughly recommend this lovely retreat. Thanks for a great stay. If you're looking for other cottages around Dairy Barn, we've got some cottages below which may take your liking. There are 104 cottages within 10 miles of Dairy Barn - and they have reviews too.